It’s a big claim, I know. But I mean it. Keeping up with the latest information on your blog topic is critical if you want to publish engaging content. This means watching the news, following key people involved in your topic and, for me at least, stalking the blogosphere for the latest and greatest posts relating to your blog. But let’s be honest, it takes time to be a blog stalker. 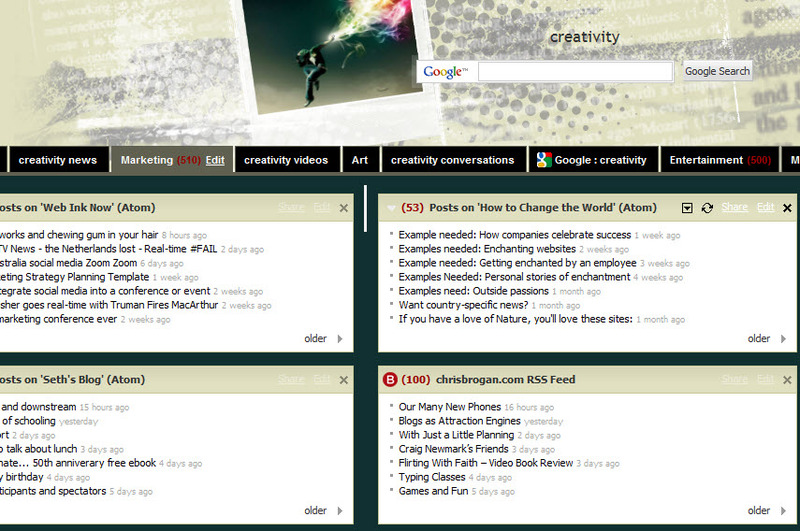 Luckily, I stumbled across NetVibes, an awesome dashboard generator. All you do is type in your interest area (presumably what you blog about), and it creates a central dashboard for the topic. The dashboard is organized into customizable tabs, with the defaults being news, videos, Google searches and conversations about your topic. You can also add as many customized tabs as you want. Just click on the green “Add Content” button to fill the tabs up with your favorite widgets and blog feeds and you’re in business. As a tabaholic and compulsive categorizer, this interface is thrilling. I set my dashboard up with multiple tabs that fall into “Creativity + Culture” – music, art, marketing, entertainment, media and culture. Every day, I can check out the latest posts from my favorite bloggers on each of these subtopics to give me fresh, relevant ideas about what to write about. Genius! What blogging tools have rocked your world lately? Have you found a different use for NetVibes? Where do you get ideas for blog posts? What blogs do you follow?